Bad luck. Injuries. Referees. Financial constraints. All of the above excuses reasons have been used to explain why Maidenhead United have struggled so badly this season. Well, they say that things even themselves out over the course of a season and it would seem that the Magpies were repaid in kind, at Ship Lane on Saturday, for eight months or so of not having the "rub of the green". Indeed, the Maidenhead Advertiser should certainly be a "bad luck, injuries, referees, financial constraints" free-zone this week. The same might not be true, however, of the Thurrock Gazette. After Jefferson Louis (widely regarded by Gasheads as THE worst player to wear the blue and white quarters of Bristol Rovers ... and that's some statement!) was ruled out through injury, Craig Faulconbridge was given the nod - ahead of Alex Wall - to start upfront for United. Rainey had commented, in the car on the way to the game, that he would rather Kieran 'I run faster off the pitch - at the end of the game, having not clapped the fans - than I do on it' Knight than either Woking loanee Faulconbridge or yellow card magnet Wall. Bob the Plumber agreed, in the bar pre kick-off, and went so far as to say that even he was quicker than Faulconbridge! Within five minutes, however, Faulconbridge was in the thick of the action; obviously manhandled as a cross came into the Thurrock penalty area. The ref had no option but to point to the spot, allowing a striker with convictions for animal cruelty and affray to squeeze the free shot under the keeper. I was able to play Nigel Keene and get a decent photo of the action (below, top). I didn't join in the celebrations of the twenty or so Magpies fans behind the goal (below, bottom), owing to the identity of the goalscorer; I'm still not at all happy that we signed Anthony Thomas (family club my arse). 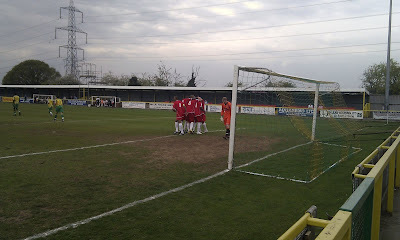 On a dry and patchy pitch, Thurrock were the better side thereafter, increasingly forcing Maidenhead onto the back foot. Nevin Saroya (who was presumably picked instead of Grant Cooper because the 'Male Model' cannot play too many games in a short space of time) looked distinctly uncomfortable against Danny Hockton, while the ever-impressive Matt Bodkin was enjoying himself against Bobby Behzadi (out of position at left back). Will Hendry looked less than match-fit and Faulconbridge, although sure of touch, was ponderous and failed to win (m)any headers against the towering Paul Olima. It was no surprise, therefore, when Thurrock equalised; Maidenhead keeper Steve Williams (who flapped several times throughout) palming a shot straight into the path of ex-Magpie midfielder Dean Cracknell, who made no mistake from close range. Indeed, Thurrock should have gone in ahead at the interval; an unmarked player heading wide at the far post as the goal gaped. A bout of shoving between Williams and Saroya perhaps best summed up Maidenhead's first half. The Fleet, cheered on by their small but boisterous band of followers (who made themselves heard throughout, in contrast to those who had travelled from Berkshire), continued their dominance into the second period and would have taken the lead if it were not for some bad luck; the ball hitting the Maidenhead bar and then being cleared off the line after another Williams flap and an almighty goalmouth scramble. They were then hampered by injury when Bodkin was forced off, severely reducing their attacking threat. The referee then began to take centre stage (never a good sign). First he decided the 'Alex Wall (on for Faulconbridge) yellow card sweep stake' and then, on the advice of the linesman, awarded Maidenhead a free kick just outside the box after the aforementioned young striker had thrown himself theatrically to the ground upon minimal contact. 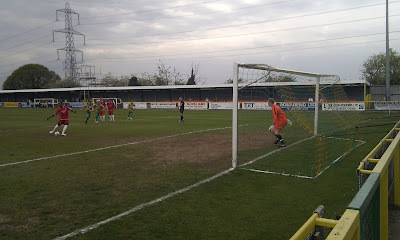 If it was a foul (and it shouldn't have been IMO), then the offending Thurrock defender should have walked, no question. Instead, he followed Wall into the book. 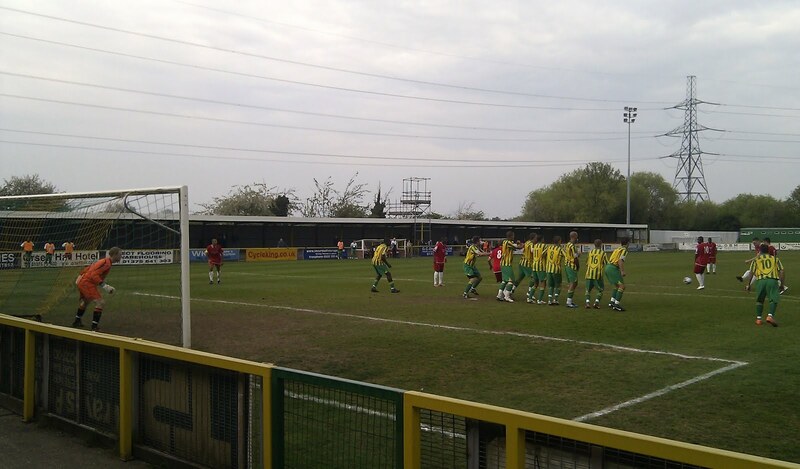 Prior to the resulting free kick being taken (below, middle), Hendry became involved in a slanging match with irritant Thurrock full-back (and Bez from Happy Mondays lookalike) Lee Flynn, sparking some minor fisticuffs (which continued at the final whistle). The ref, rapidly losing control of the game at this point, spoke to seemingly everyone bar Flynn! Thurrock's major gripe with the ref came after the game's winning goal, though, which in turn followed the belated introduction of Ashley Smith (how he cannot get into this Maidenhead side, I'll never know ... well, I do, Drax doesn't like him). The goal was also preceded by several Maidenhead fans, including me, lamenting what a dreadful game we were witnessing (one particularly aimless Saroya hoof brought audible groans) and saying that we'd happily take a draw (bearing in mind Thurrock's difficult run-in). As it was, the hitherto ineffective Max Worsfold (who looked neat and tidy, but a bit lightweight) cut inside a defender, onto his heavily favoured left foot, and lifted a delightful curler into the goalkeeper's top right-hand corner, sending the travelling support into raptures (Leicester Les ripping my coat in the celebrations!). As soon as he hit it, we knew it was in. A great feeling! The perhaps-overly-dramatic PA man announced the goal as coming in the 91st minute and so we naturally assumed the final whistle was imminent. It wasn't until after 5pm, however, that the game actually ended; the official inexplicably finding several extra minutes (of 'Fergie time'). During this nervous period he nearly gave me and several other Magpies fans, I'm sure, a heart attack when blowing his whistle as a cross was lifted into the Maidenhead box and a loud appeal went up. It initially looked like he had given a penalty, instead he had awarded us a free kick. Mr Logic spoke to the noisy Thurrock lads in the bar afterwards and they were adamant it was a clear handball by a Maidenhead player, prior to any Thurrock indiscretion. As such, our relief was palpable at the end of the game. Chants of "we are staying up" were tempered somewhat by the realisation that we had played our 'get out of jail, free' card, robbing the Fleet of (at least) a point. To be fair - in stark contrast to Dartford - Johnson Hippolyte was quick to applaud the fans, followed by most of the players (the irony being that the vocal support at Princes Park was significantly more impressive than the comparative whimper at Ship Lane). Hats off, performance-wise, to Ashley Nicholls - who was easily the best Maidenhead player - and full-backs Leon Soloman (a good outlet on the right) and Bobby Behzadi (tireless, as ever). John Scarborough was also solid, while Worsfold's goal was a beauty. Everyone else, to varying degrees, had games to forget. Still, it was the result, rather than the performance, that was (vitally) important. 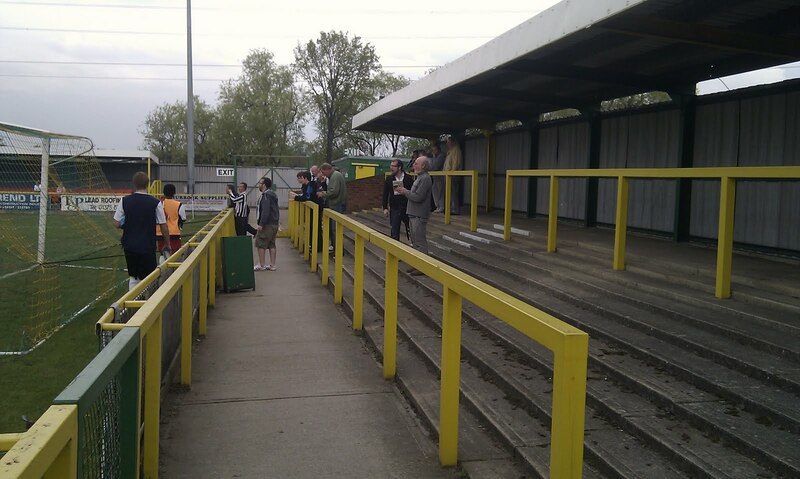 Thurrock are more or less down now and the dejected look on their fans faces, in the bar afterwards, told their own story. 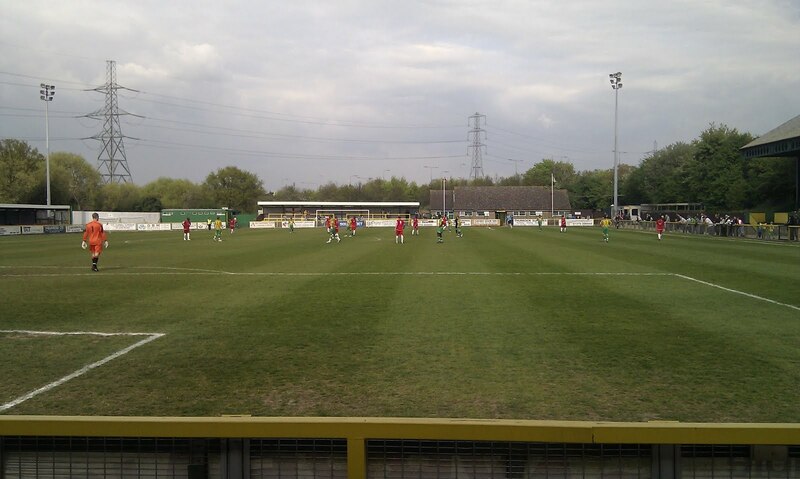 Despite the fact that they were probably the better side on the day and (at least) deserving of a draw, IMO this is the worst Thurrock side I can remember. Well, perhaps not the worst, but certainly the most timid. Bodkin going off certainly didn't help them (he destroyed us at York Road last season and had the beating of Behzadi on Saturday), but the days of Cliff Akurang and Tresor Kandol, Jimmy McFarlane and John Purdie etc., etc. bullying (in a good way) other teams out of the game seem long gone. There was a sense, as we left the ground, that we might not be back again any time soon. Good riddance, some might say. 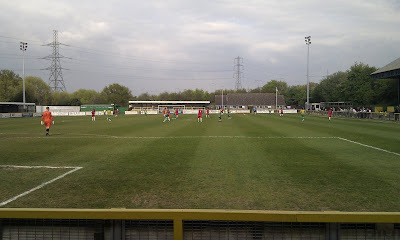 And while I certainly won't miss visits to Thurrock (I've always quite liked the ground, if not the journey around the M25 to get there), I do wish their supporters - particularly the (relatively) new ones who clearly like a sing-song - all the best. As for Maidenhead, (belatedly) splashing the cash on a plethora of experienced players (in addition to a plethora of inexperienced players), in a bid to beat the drop, is seemingly paying dividends. There might be sides in this division that have greater financial muscle than us, but complaining about not being able to compete with the likes of Farnborough CVA misses the point. Bristol Rovers, for example, cannot compete financially with the likes of Southampton in League One. They can compete (and some) financially with the likes of Dagenham & Redbridge and Exeter City, though, in the same way that Maidenhead United can compete financially with the likes of Weston-super-Mare and Thurrock. The artificially-created Conference South is starting to 'right itself', however. As aforementioned, Thurrock will more than likely go this year. Who else, among the 'have nots', will be left? Not many. For "real sense of achievement", if/when we beat the drop this year, read "blowing another £125K on merely delaying the inevitable". Enjoy it while it lasts, they say. Well, the only things I really enjoyed on Saturday were the pre-match cheeseburger (are the famous Fleet burgers still available? I didn't see them advertised), Worsfold's great strike, the fact that Maidenhead won (albeit undeservedly, what was a pretty dire game between two poor sides, which cost a rather steep £12 to watch) and the chance to meet with some friends who I hadn't seen for a while (Bobby P, for example, was regaled during the first half with anecdotes from last month's trip to Berwick). 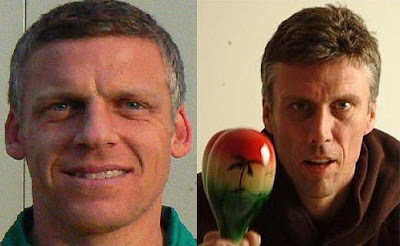 Hey ho, here's to Fancy Dress away day at Truro next season! PS > I'd like to point out that I correctly called the 2-1 scoreline! PPPS > I read on the forum today that, in a bid to beat the 'York Road curse', the manager urinated in each corner of the ground after our goalless draw with Humpton (which preceded our 1-0 win over Eastleigh, our first home win in more than seven months). Rather apt, bearing in mind some would say that Drax has been taking the piss all season! MAGPIES WIN LEAGUE GAME AT YORK ROAD SHOCK!! !